In life people can usually be divided into two categories, the lovers of the round ball and the lovers of the oval ball! I am a round ball person myself though I expect to get drawn into the excitement of the 6 Nations Championship which has just kicked off. Both Rugby Union and Rugby League seem to have grown in their range an appeal, even to someone like me who finds the rules incomprehensible. 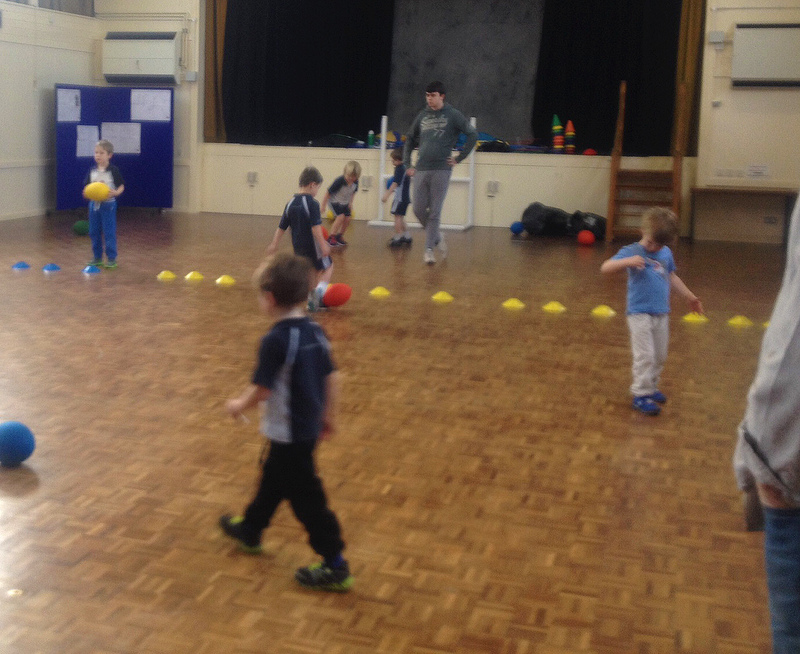 In Tarvin Community Centre on a Saturday morning an eager group of boys (and a few girls) gather to learn the basics of rugby with Rugby Tots. This company, a successful franchise, has been going since 2003, and provides a programme designed to use the multiple skills of rugby to create a fun and enjoyable environment while developing basic core motor skills. While playing a number of exciting games with a suitably soft oval ball, kids learn co-ordination and control, team skills, co-operation and the arts of winning and losing with grace and good humour. If you have a little one from – well, maybe 3 or 4, with lots of energy to spare, then do consider this great class. I suspect that not many of them will go on to score the winning try at Twickenham – or even a goal in the F.A. Cup at Wembley, but they will have learnt that sport is fun and exercise a great pleasure. Hopefully this will influence them for the rest of their lives, keeping them fit and healthy. If nothing else, it will get rid of some of that surplus energy! Is Tarvin Children’s Centre to Close? Cheshire West and Chester Council (CWaC) is holding a consultation on “de-registering” some of its Children’s Centres, including the Tarvin, Malpas, and Farndon Children’s Centre which is based at Tarvin Community Centre. “De-registration” means that Children’s Centres would not be subject to an Ofsted inspection. It is possible the space could become available for broader community use. Some of the current activities might continue, if the organisers want to continue to run them or if a new organiser can be found. However, CWaC says that in the current economic climate it needs to concentrate more on services for children and families in greatest need, and less on buildings and other overhead costs. In making its proposals CWaC says it has looked at information about attendance usage and registration rates at each children’s centre, as well as levels of deprivation and levels of need, and any compliments or complaints. In the case of the Tarvin, Malpas and Farndon Centre, it says that the level of need is less acute, that usage is low, that the location is not easily accessible and that services can be delivered by other organisations through different commissioning arrangements (for example NHS services commissioned with different building management). Please note that, as yet, there are no firm proposals for the use of the space at Tarvin Community Centre, although the Community Centre Committee of Management has talked to CWaC and asked to be consulted about any proposals. http://www.cheshirewestandchester.gov.uk/your_council/consultations_and_petitions/council_consultations/childrens_centres_consultatio.aspx. You can also email childrenstrustwest@cheshirewestandchester.gov.uk with your views. Use the form below to contact the webmaster to raise any issues about the site. The webmaster is not on the board for the Community Centre and has no dealings with the Community Centre so any requests for general information should be sent using the relevant web form. On Tuesday evening the Community Centre hosted a Reception to celebrate the signing of the new lease. The Committee were delighted to welcome members of the many clubs and organisation who use the Centre and whose regular contributions help pay the bills. Also present were residents who have been involved with the running of the Centre in the past. It is this continued support and commitment from so many individuals that makes such an important contribution to the Centre’s success. Also present was Councillor Mike Jones, the Leader of Cheshire West and Chester Council and Councillor Lyn Riley whose responsibility within the Executive is for Localities. The Council are the Centre’s landlords and their support is important in ensuring that the building and the ground are kept well. Providing local services in new and innovative ways is a key policy of the Council and the way the Community Centre is managed ticks many of their boxes. Alan Wilkinson, Chair of the Committee said ‘It was a great pleasure to welcome our guests and say a big thank you for their support. The new lease means we can start applying for grants for improvements to the building so we can offer more opportunities for the community to get together. We are very, very ambitious for the Centre’. After the Reception the Annual General Meeting took place and the Committee was re-elected for the following year. Thanks were given to Richard Orfanelli who stood down as Treasurer after many years of service. Richard was the sole survivor of an earlier Committee whose resignation was the catalyst for change. His contribution has been much appreciated and was marked by the presentation of a small gift. Ted Lush will take over as Treasurer and Sue Hardacre will take the role of the Parish Council representative.